Sometimes, I get a plan in my head and refuse to let it go. Like a family outing of raspberry-picking. Even if it’s down-pouring and I’m the only one not skeptical. We loaded in the car, geared with coats, boots and umbrellas. Someone suggested we have a “Plan B,” but I was locked on Plan A. I assured them the rain would stop by the time we arrived. After all, I’d gotten my meteorologist degree from App-Store U. As Dark Sky (my fave weather app) or luck would have it, the sky turned blue as we turned into the (empty) parking lot. It was such an un-ideal day for berry picking, there weren’t even employees at the u-pick. Just an honors system of a money-box, a stack of containers and a note. With the arrival of the sun, the family got into it. The boys were running up and down rows of raspberries, learning which to yank and which to leave. Of course, a few made it into their mouths, too. Nana and Poppy were taking grandparenting seriously, filling up containers and engaging the kids along the way. Dark Sky announced a six-minute countdown before the rain would resume, so we hurried to fill our final container. I headed down the lonnnnnng row of berry bushes to leave the patch. Each boy was carrying a full container. I was carrying four. As I passed by the bushes, they were calling out to me. Beautiful, perfectly ripened red raspberries begging to be picked. Jack would say “oh, this one is a beauty! I just can’t resist!” Four plastic quarts in my hand and I was still reaching out to pluck the perfect ones from the bush. It was hard to stop. Every inch forward, I’d spot another beautiful berry. Just one more, I’d think. They were hard to resist. But, each “one more” would never be enough. There were berries as far as the eye could see and I wasn’t tasked to pick every single one. Plastic fruit cartons are unstable in tower form. Had I already forgotten the blueberries fiasco? 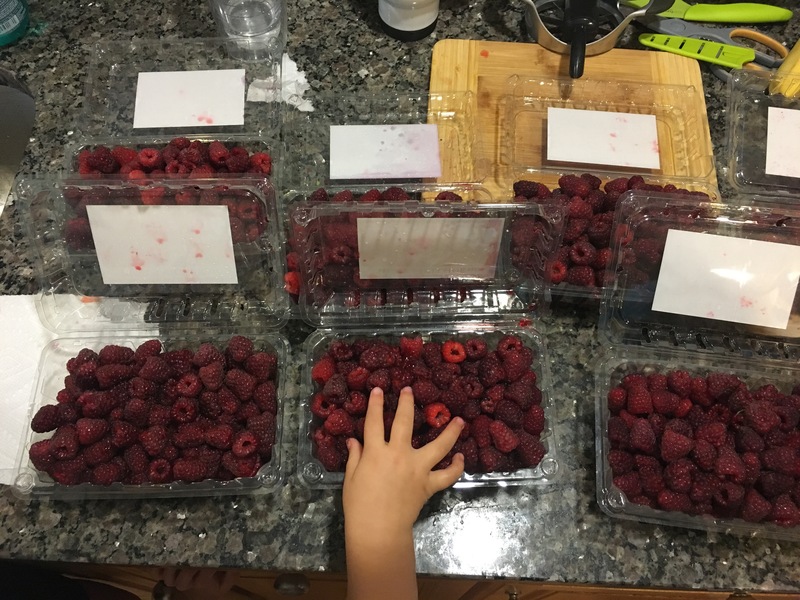 Which of the “one more” raspberries would bring on the tipping point and the demise of our haul? There is always another raspberry. Good things, but “one more” won’t satisfy. One more ____ just makes me want, yet, one more! And at some point, unless it’s something I have the capacity to have infinite of, some part needs to be the last part and I need to say enough. There are healthy boundaries in being done. In the disappointment, discipline, wisdom. It’s a challenge, but denying the “one more” grows me and can prevent negative outcomes. Like dropping an hour’s worth of u-pick all over the ground. I’m rather relieved that is not my story to tell. This time around, I contained my produce. But, I still caught the lesson. Leave some on the bush. They aren’t all mine to pick. There are days when things just have to be left undone. I can’t be it all and do it all. I am not all. We returned home with seven quarts in total. And then we all looked at each other and wondered what in the world we were going to do with seven quarts of fresh raspberries. Our refrigerator and freezer died on the eve of our picking, so the freezing-them option was off the table. Because of the rain, the berries wilted significantly on the way home. We were staring at seven pathetic containers of raspberry-mash. Suddenly, I was pinning every raspberry recipe I could find. Four hours in the kitchen to salvage $28 of u-pick berries. Of course, I won’t complain about raspberry crisp, raspberry bread and dozens of raspberry cookies. In the moment, each “one more” berry looked redder than the last, plumper than possible. Each one called out as if it was a once-in-a-lifetime opportunity. In retrospect, each of those “one mores” became a burden to be dealt with. Because, the extras weren’t mine to pick. I was drawn to them, but they were not for me. And taking them on brought more upon myself than I was prepared for. I need to carefully and awarefully tackle my days. Stressed is not a virtuous way to live. Trying to fit 30 hours of work/life into a 24-hour day is not an assignment I’ve been given. It’s hard for me to say no, to turn off, to be done. It’s a challenge to know my limits and live within them. But, it’s unfruitful to take on a load I’m not called to bear. There will always be one more berry. It will always look delicious and opportune. But, if it’s not for me, it could send the rest of my life toppling over.